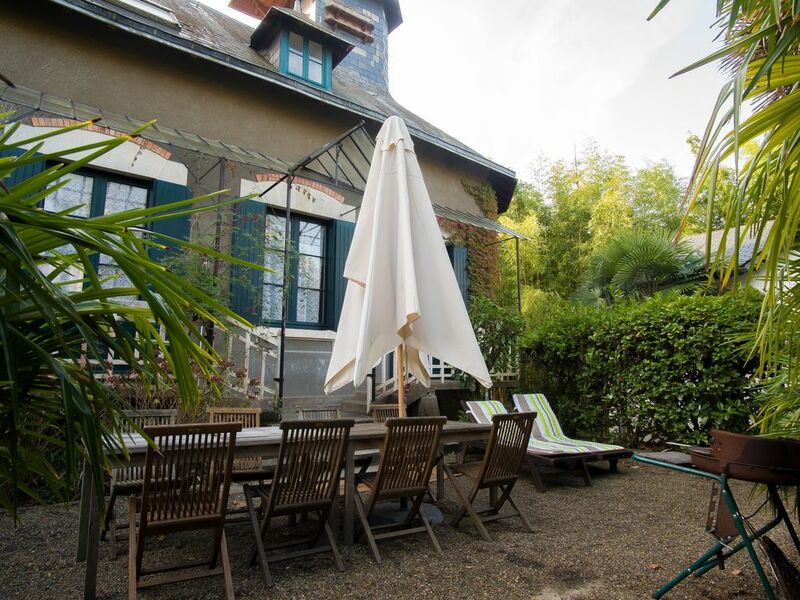 Charming house, located in front of the castle, in the pavilion with 1 bedroom, 1 bedroom with 3 single beds, heated pool, tennis court, children's playground, a 4 ha exotic setting with lake for fishing, giant bamboo, track bike from the Castle, bike rental to the village at 400m. Nearby, surf schools, canoeing, tree climbing, horse riding. Quiet games for children, sandbox, 4 ha park 10 kms from the Ocean, 5 guest rooms in the castle, heated pool, tennis, lake for fishing, secure parking inside the property, bike rental and bike path at 200m with access to the beach and walks in the forest, only 10 cottages and houses in a place ideally located and quiet for family holidays. 'The paradise for children' From the heart of the Landes, you will discover Aquitaine but also the Basque country, and many points of interest nearby. A paradise for children, 9 kms from the beach, quiet at Belle Epoque Castle with a park of 4 ha. Many bike paths accessible at 400m from the estate; canoeing, windsurfing, surf school, golf, boat trips, karting, horse riding and walks on the beach, visit the Basque country within one hour. In addition to the spa specificity of the city formerly called Acquae, Dax contains the history of its arena, the history of bullfighting having begun in 1784. The first arenas made of wood built Place de la Course were renovated in 1913 in a Hispano Moorish style. You will now discover an imposing building with tiles and red louvers on a white background, like the plazas of Seville and Cordoba. Today 8,200 seats are available to fans for the bullfights of Feria in August and Toros y Salsa in September. Beautiful Italian style home with a vineyard spread over 2.5 hectares, it houses the largest armagnacs in the region including the 1974 vintage. The master of the house also got the silver medal for the 1988 and bronze for the under 10 years. Natural refuge, it retains within it one of the geological curiosities of the department: the fault of the Guf, a marine pit that could reach 3,400 meters deep. It is the oldest port in the Landes, in which stayed Henry IV and transformed by Napoleon III to facilitate docking, and nowadays offers more than 1,000 sites to boaters and fishermen. Wallaby of Australia, parrot of Gabon, vietnamese pig, metallic blackbirds of East Africa ... 200 animals share a park of 3 hectares. Explanatory panels allow to know more about each race. Last year a new animal was born, a little yak christened Friday the 13th. The park is in the middle of the forest. A freshwater lake in the heart of the city built in the seventeenth century and buildings of neo-classical style are the keys of this city where Paul Marguerite, André Gide, Paul Claudel and other writers, poets, musicians or great couturiers loved to dream. Without forgetting the beaches and the greens on which François Mitterrand came until the end of his life. In this gallery of photographs dedicated to the beauty of the Landes forest, "magical and majestic that plays with the lights and jostled by the seasons and the winds", you will not fail to escape. The photographer, Bertrand Brouët Willaumez installed his pictures in an old grocery store in the village of Onesse. A nice trip to make through the pines, lakes and mists of the dawn of the largest forest in Europe. Fascinated by exotic animals, you will discover more than 150 species of live reptiles ranging from python to anacondas without forgetting the turtles or crocodiles of the Nile. The novelty is the Iguana Park, a kind of aviary where animals roam freely.